As well as being easy to clean, suspended aviaries make sense for bird owners who live on acreage properties, especially those with a dam or near a creek. This is because there is more danger from snakes in these areas. They also provide some protection from mice. Mice will steal your birds’ seed, leave their droppings in the cage and also be an added attraction for snakes. Mice can burrow through the ground in a conventional ground aviary, unless it is seated on a concrete floor. Even a layer of stones on the bottom of an aviary will not not deter mice :(. Although this may look like a bank of aviaries, it’s actually 6 single suspended aviaries in a row. Suspended aviaries can be built to any size. Smaller ones can be combined as double or triple suspended aviaries. Suspended cages are a good option for those on water restrictions as they are self cleaning, most of the droppings and waste food will fall through the wire bottom. This also provides some food for wild birds, who will collect under the cage to polish off the scraps. They can be built with a full colorbond roof or half colorbond & half wire so the birds can have some exposure to the weather. We also build chicken runs, cat runs (keep out of trouble with the local council!) guinea pig cages and other types of enclosures. 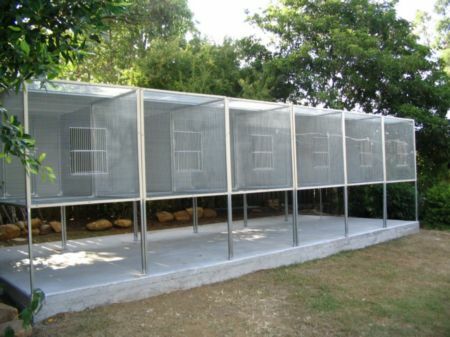 Most of these aviaries can be customized to the bird owner’s specifications. Clive is one of the most experienced aviary makers in Qld. He can offer advice on the best aviary to suit your breed of bird and your location. We have suspended aviaries for sale in Brisbane Queensland ( Qld ). could you make me a possum aviary? needs vermin and snake proof wire 2x2x3. Doesn’t need walls or roof. I will place logs and nest box inside. Cost? delivery cost? pick up? flat pack option and I’ll assemble it? I’m interested in buying 3 single suspended aviaries. Can you please send me a price and pictures of the back and inside as you only have the front view on your website. Im interested in the 3 bay aviary you have on web page , what are the dimensions and price and could you send a few more pic’s as well please. I also live at Moorooka were are you located ? Im interested in the 6 bay single suspended aviary in a row you have on web page , what are the dimensions and price and could you send a few more pic’s as well please. I also live at Ipswich were are you located ? Could you please quote me on a suspended aviary 3m x 1m x1m. could you please send me the price for your 3 bay suspended Aviary. thank you. How much for a 5 bay suspended aviary?? Do you have a shop where we can come look/buy avaries from you please? ? Hi peter did you end up getting one built? 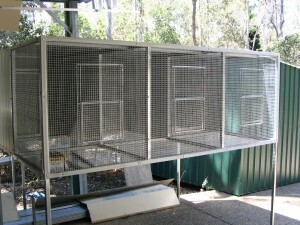 Are you still making aviaries and can they be posted to toowoomba area QLD australia? I am in Adelaide, would you supply detailed plans for a price? Can I please have a quote for a single bay aviary.